Marc Gicquel was totally knocked out after receiving a serve moving 208 km/h just where it hurts the most. It was a genuine killer-serve by German Benjamin Becker in the second round of the ATP-tournament in Halle (Germany) Thursday. Opponent Gicquel didn’t manage to react at all before the ball travelling at 208 km/h joined his own. 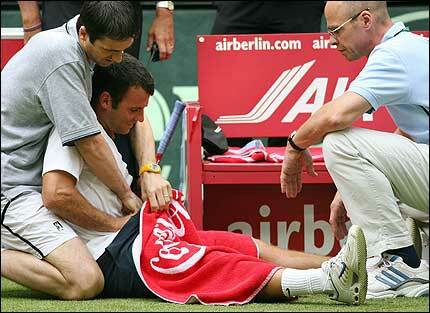 The Frenchman went straight down on the grass but a medic immediately rushed to help. The first-aid consisted of immediate rest in the most comfortable position possible (if any). After a while the poor Frenchman moved to sitting position and received a bag or two of cooling ice from the manly helper. The player himself helped by placing the “treatment” to its final destination (for the record). The medic also kindly encouraged the crowd to stop laughing even though the situation was rather funny (even Gicquel seams to be smiling). At the end of the game Gicquel could look back at a great win (6-2, 7-6) and probably down at two (temporarily) tennis-sized body parts. In the third round he’s facing Jarkko Nieminen from Finland.